The Orillia Food Council is a emerging organization whose mission is to inspire, nurture and advance healthy food policy and projects by uniting the voices of local food initiatives. Orillia Community Gardens, along with The Sharing Place Food Bank and the Simcoe Muskoka District Health Unit began the process in late summer of 2013, which the initiation of Growing Orillia’s Food Future, a pre-cursor to the Orillia Food Council, which was a movement to start the dialogue around the need for healthy food policies and food security in the city of Orillia. Below is a brief outline of the phases of evolution. During this time, Growing Orillia’s Food Future has been engaged in a community-led process towards the establishment of the Orillia Food Council. Numerous well attented public forums have been hosted , including a candidates debate on food issues during the provincial election. Food issues gardenered signicantly greater attention during the municipal election, resulting in the ongoing support of several newly elected Orillia City Councilors. Thanks to another grant from the Healthy Communities Partnership Fund, the Orillia Food Council (food event planning committee) have organized Food Democracy, to launch us into our next phase of development, concretizing our structure, processes and priorities, while unifying local food initiatives to promote healthy food policies and projects. The Sharing Place food bank, in partnership with Orillia Community Gardens, were awarded a grant through the Province of Ontario’s Healthy Community Partnership fund to initiate the development of food policy to promote food security within the city of Orillia. With the support of the Simcoe Muskoka District Health Unit and many other community food partners this grant has helped promote local food security and increase awareness and access to healthy food for all. Beginning in the fall of 2013, diverse groups and individuals began contributing their ideas and experiences through a series of participatory public forums and a simple survey. 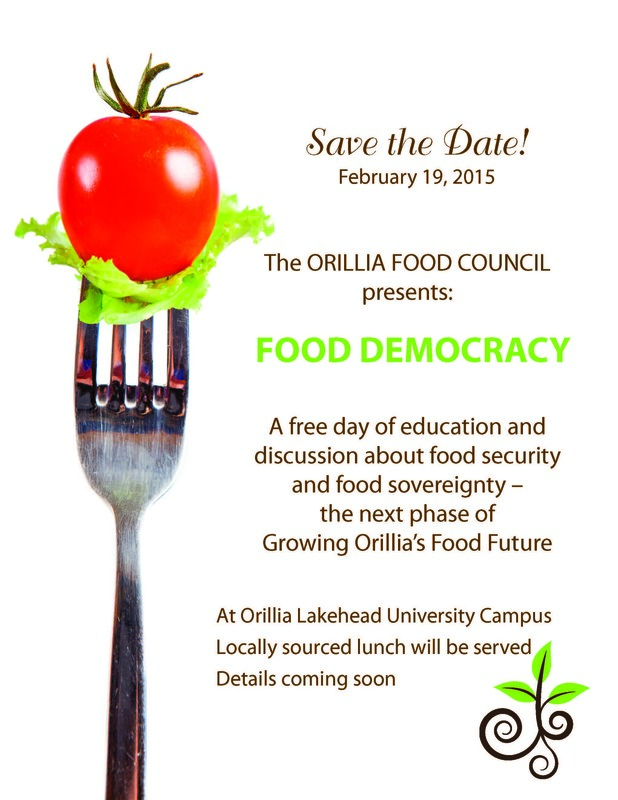 These forums took notice of the current state of food in Orillia. From these forums a team of students from Lakehead University gathered and arranged the data to produce “Growing Orillia’s Food Future – December 31st, 2013 Community Report”. In addition the first Food Access Maps of Orillia were formatted and printed, and unveiled at a community meeting on Feb 5th, 2014, now to be disseminated throughout town. We have put food on the map. The map includes but is not necessarily limited to food banks, soup kitchens, community kitchens, meal programs, community gardens, local farms, markets and more. We are looking for additional map hosts to host the map and conversation at a variety of places around town. This map simply paints a picture of where we are, in order to see the gaps and opportunities in our community and envision the future of food in Orillia. Building upon the Simcoe County Food & Agriculture Charter and the Severn Sound Sustainability Plan, both endorsed by the City of Orillia, Growing Orillia’s Food Future represents the next phase – from words to actions. Local and action-oriented policy has the potential to finally begin to address the increasing food emergency distressing thousands in Orillia. Local food policy, drafted for and by the community, will empower the upsurge of grassroots projects with practical solutions. Growing Orillia’s Food Future will animate the six core principles articulated in the Simcoe County Food & Agriculture Charter, and underline the need to support both equal food access and the production of food in healthy, ecological and economically sustainable ways. Neighbours and friends, join us at the table and in the garden as we grow the future of food in Orillia!